Maddalena Forcella is an Italian fashion designer who has lived in Mexico most of her adult life. She works in felt and creates beautiful, comfortable clothing that is Art-to-Wear. In the workshop we create the felted nuno cloth and then design garments using indigenous Mexican textile patterns including the quechequemitl, huipil, rebozo and blusa. You can adapt these to your own fit and style! When? 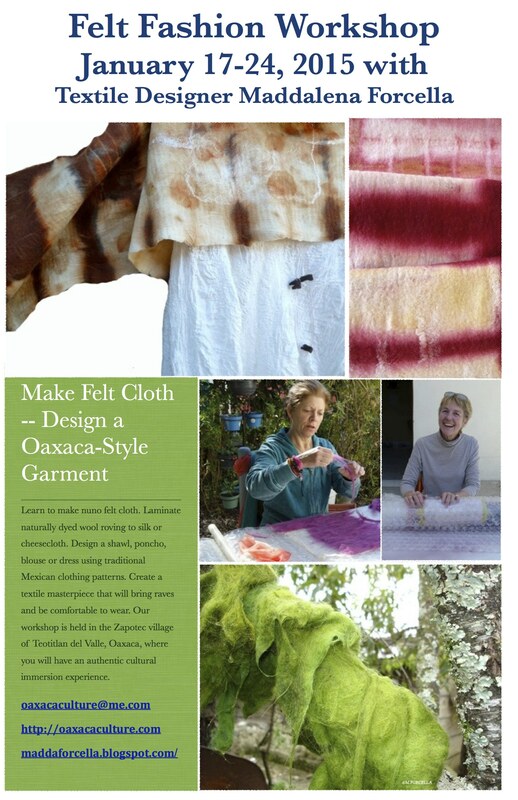 Felt Fashion Workshop, January in Oaxaca, where the sun still shines in winter. See Maddalena’s work at the Museo Textil de Oaxaca. This entry was posted in Cultural Commentary, Textiles, Tapestries & Weaving, Workshops and Retreats and tagged class, clothing, conference, course, design, fashion, felting, Mexico, nuno, Oaxaca, seminar, silk, textile, wool felt, workshop. Bookmark the permalink.